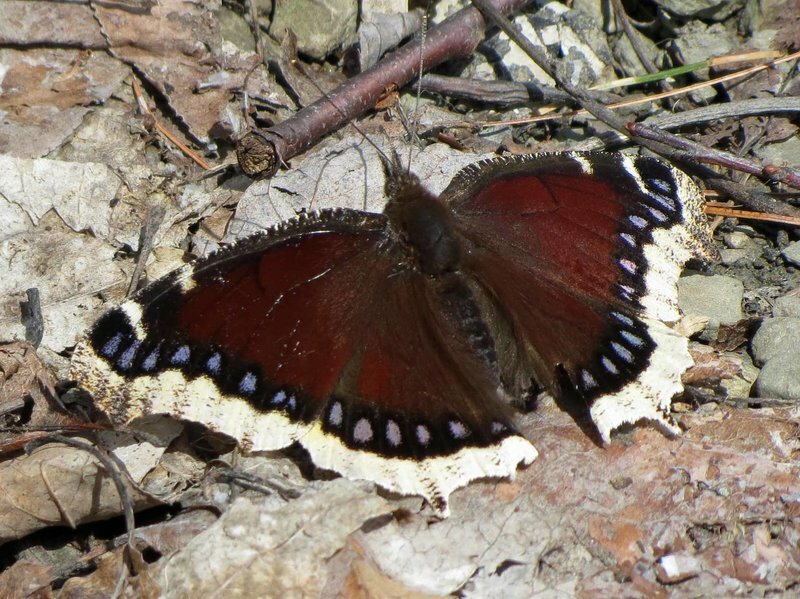 First Butterfly seen in Chappaqua area for 2013. Large group nectaring on willow catkins of a shrubby willow. Amazing sight! First butterfly of season. Seen along side of road near Boonton Reservoir. 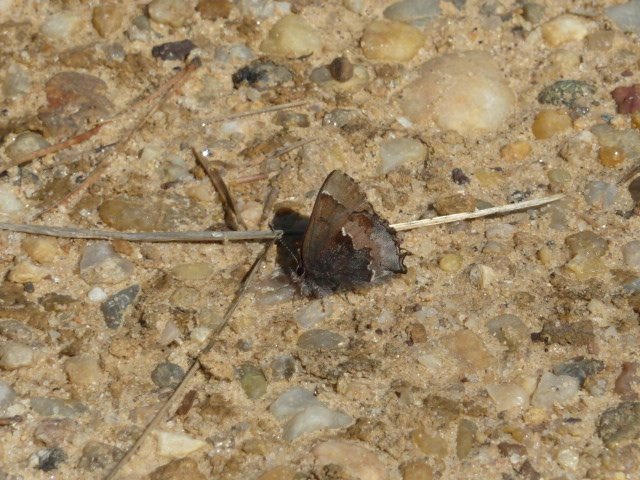 Henry’s Elfin seen basking on dirt road through pine-sand barrens; all the Mourning Cloaks were flushed up from sun-warmed asphalt along the Wildlife Drive. Sunny but still cool, about 55F. 3 mile walk on the west side of Grapevine Lake. My first Wisconsin butterfly in 182 days! 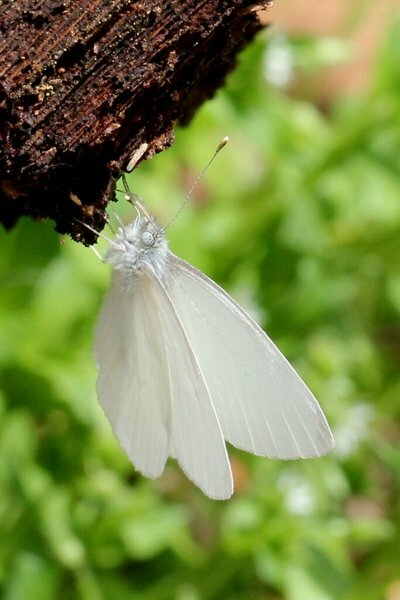 West Virginia White was sipping moisture from a rotten log. The contrast of the ghostly white butterfly against the dark wood was spectacular. Eastern Tiger Swallowtail was a surprise on this first really warm and sunny day of spring. No whites or azures seen but soon… the temp. today up to about 70F., light cloud cover & a lot of sun. Butterflies seen along the path / trail that runs along the Northeast Branch of the Anacostia River between River Road and Paint Branch Parkway. 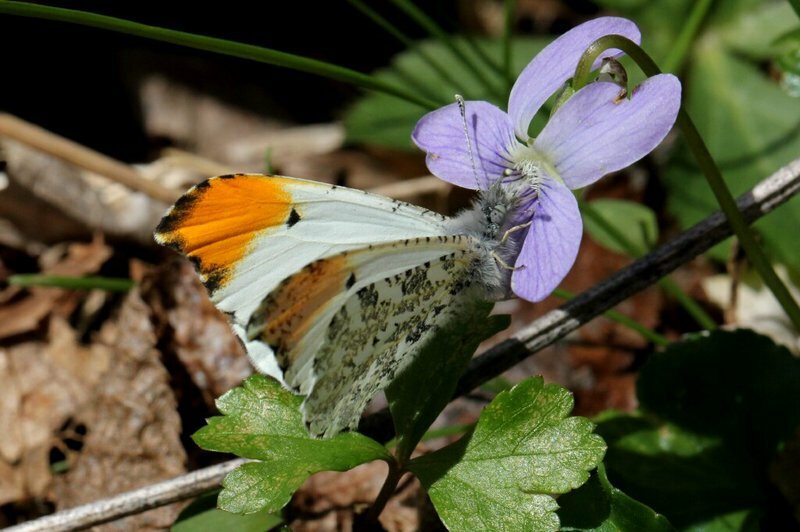 The Falcate Orange Tips were all males. First Cabbage Whites of the season! First (counted here) in an industrial park in Parsippany, NJ, another alongside Route 287 in Boonton. To paraphrase Jeffrey Glassberg, they certainly bring life to the most dismal of places! My first butterfly sighting of 2013… Very tardy, because of chilly, windy weather (until this week! )… Last year, saw my first Cabbage White around this location by March 12th! In a typical year, first Cabbage Whites observed in range of March 28th—April 1st. Delaware Nature Society reported Cabbage Whites a few days ago; also Mourning Cloaks & Question Marks! Whites, Duskywings, Checkerspots, Yellow Swallowtails flying but would not stop for identification. Cline Gulch is near the old gold mining town of French Gulch in Shasta County. 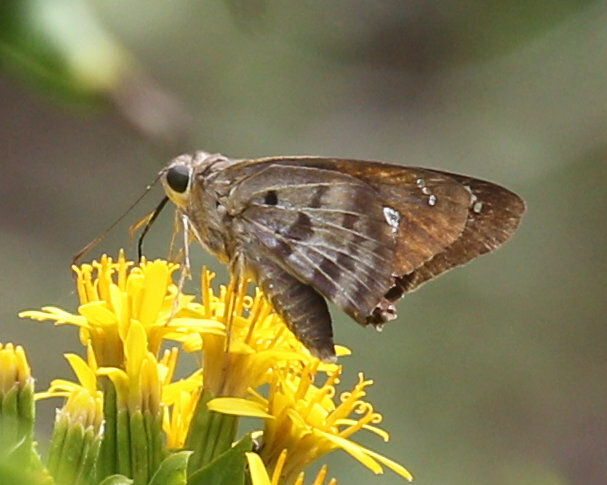 I saw a very early Common Roadside-Skipper nectaring on a violet along the road. This is an early record for this species in the State of California. 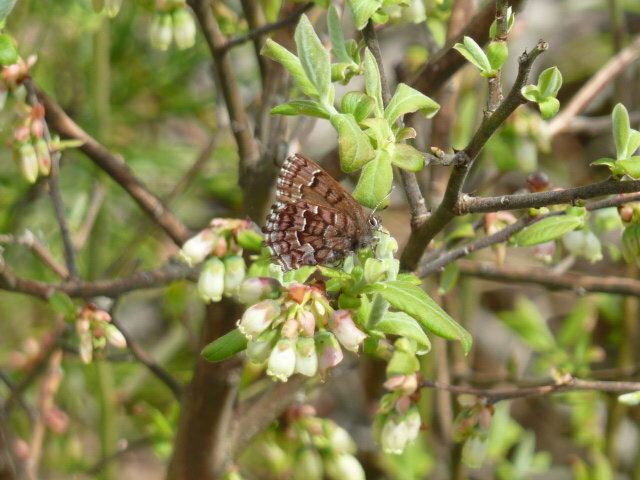 The floral and Lepidopteran phenology is roughly one week behind the seasonal average. Still had some neat sightings. Habitat is typical of the northern Ozarks. Saw whites, yellow swallowtails as well but could not ID. Phenology 2 weeks behind an average year and about a month behind last year. Under 65 degrees, breezy… Doubtless some Anglewings, Mourning Cloaks didn’t come out! Temperatures barely above 50 degrees and windy, many of the butterflies seen earlier in the week were absent. Numerous unidentified leafroller moths were still out. E. Tiger already out here for over a week. Whites, Falcates are over 2 weeks later than in 2012. All of the butterflies aside from Mourning Cloaks were staying low, in a stiff wind, grudging sun and below-60F. temp. Wildflowers mostly still in very early stages. Late start for the Spring Azure. First truly warm day, temps in the upper 60s. Cabbage Whites out in force and first Spring Azures. Interestingly, many of the Cabbage Whites seemed to be headed due North without resting. Late afternoon, sunny and hot following a mostly cloudy, muggy day. 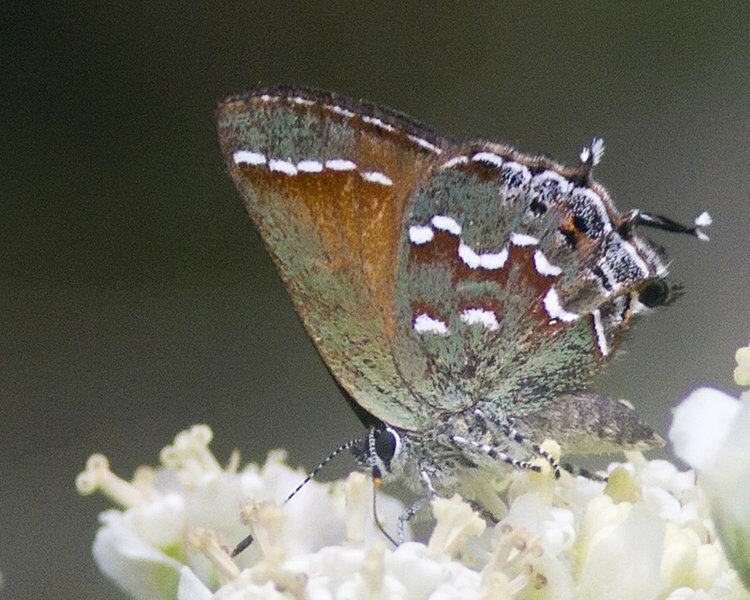 Strong flight of Zebra Swallowtails and Eastern Tailed-blue; FOY Juniper Hairstreak. Four Azure spp. as well not identified to species. Elfins were in the utility powerline at the end of Cash Lake that parallels MD197, nectaring on Vaccinium corymbosum. About 6 miles west of Redding, CA in the Clear Creek Greenway off of Cloverdale Rd. The local population of CA Marbles (Euchloe hyantis) are now on the wing. The Jewel Flowers are just beginning to bloom. Saw 4-6 individuals today. Arogos Skipper very worn. He was on the same thistle when we returned a few hours later but the wind was blowing so hard it was hard to get anything other than this image. Most thistles past bloom. Area very dry. Good variety for early in the butterfly year. Wide range of wear on about 8 individual Muirs’ Hairstreaks. The one pictured was the freshest. They were nectaring on shrubby low willows and staying mainly near the few water puddles still in the stream bed. Walk downstream (north) in and next to the stream bed. Cool but sunny pm. Very few leps moving. 4–5 p.m., Temperatures in 52—54 degree range. Hoped to see Falcate Orangetips, but found none. But did see a rather small Zebra Swallowtail, which is uncommon at Nottingham any time of the year, despite being just north of Cecil County, MD. Except for Cabbage Whites, all butterflies were my first such sightings of 2013. Exceptionally fresh Zebra Swallowtail & Juvenal’s Duskywing. 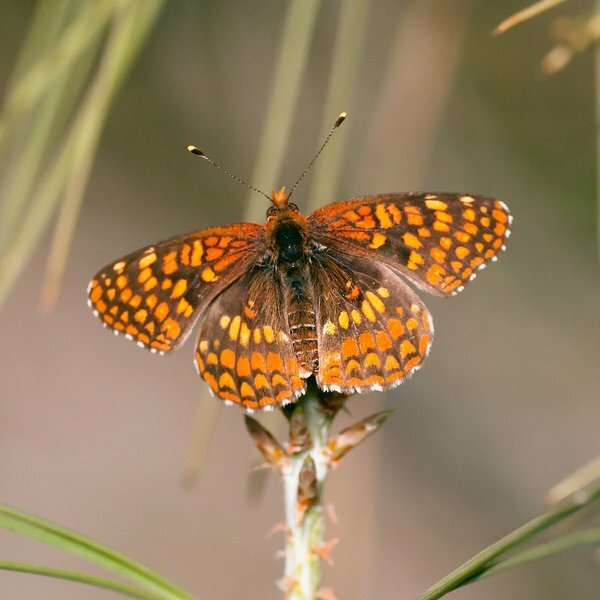 Despite the cool temps, we were able to score a couple of FOY butterflies along the Critical Area Driving Tour through mostly upland woods along the Patuxent River/Jug Bay. Beth Johnson and Tom Stock also came along. Zebra Swallowtails were common, and the Eastern Tiger Swallowtails included 2 dark-form females. 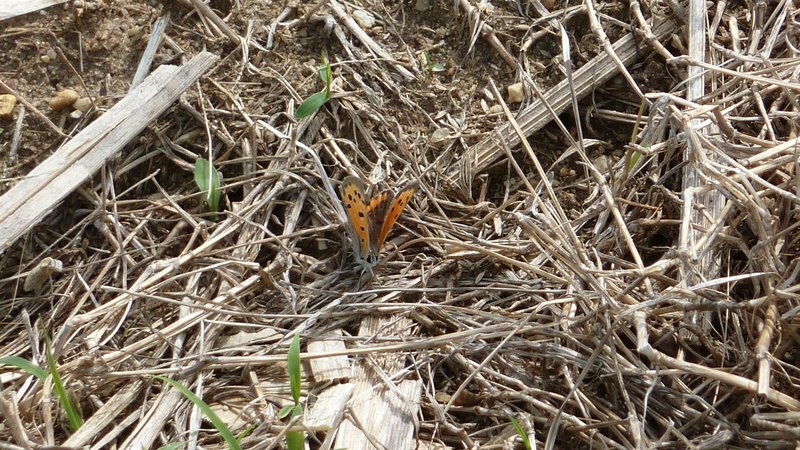 The Variegated Fritillary and American Copper were both surprisingly early for this slow spring. Second weekend in a row and second state where only one species of native butterfly was on the wing. Hammock Skipper. These seem to show up periodically in April, and then again in late summer-fall. Falcate Orangetips out, but missing Juniper ‘Olive’ Hairstreaks; unfortunately, stands of Red Cedar near entrance were cut down about 2 years ago. 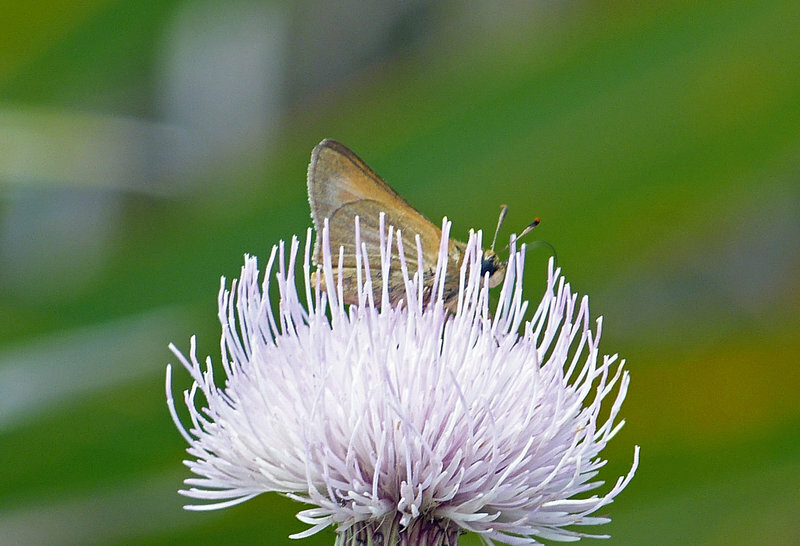 Also missed Cobweb Skipper, which is a specialty of bluestem fields here. Falcate Orangetips, Meadow Fritillaries, & Pearl Crescents first for me in 2013. This isolated population continues to hang in there despite several factors that have impacted it. No Brown Elfins yet and the blueberry bushes haven’t bloomed yet. 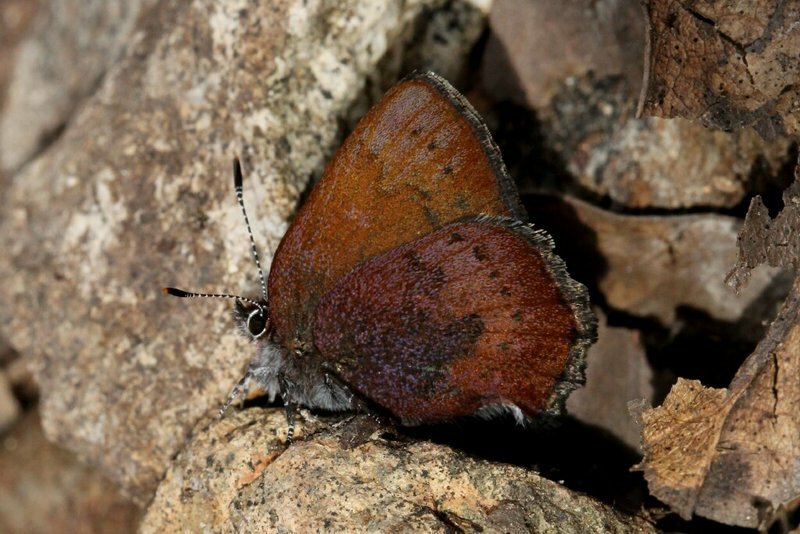 Also many azures and duskywings unidentified. Some azures seemed to be large and bluer than others, some were smaller and darker. Some of the tiger swallowtails seemed larger than others. Weather warming fast - low 90’s in Redding. Activity picking up nicely! 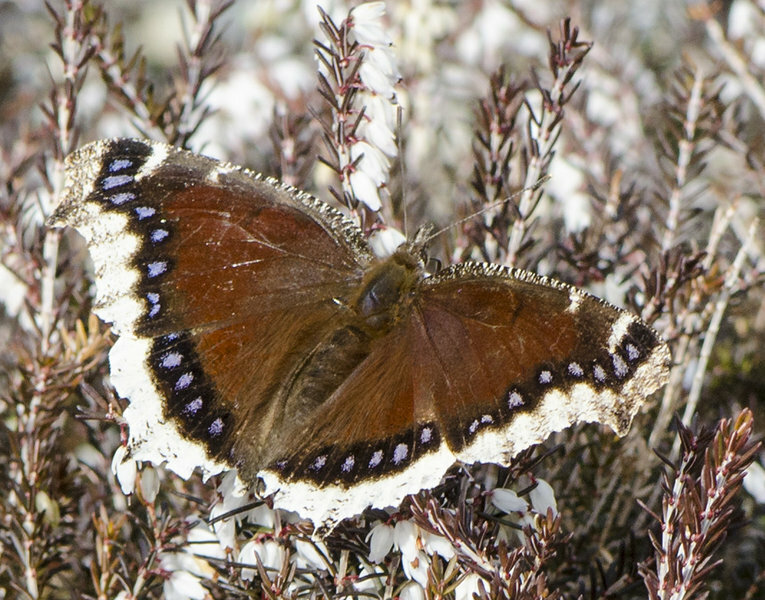 There were both Hoary and Satyr Commas flying — hard to tell them apart in flight but number reflects what I’ve ID’d. of Red Admirals last spring, I have not seen one yet this year. First butterflies of Spring; Sunny, 61 degrees with light breeze. 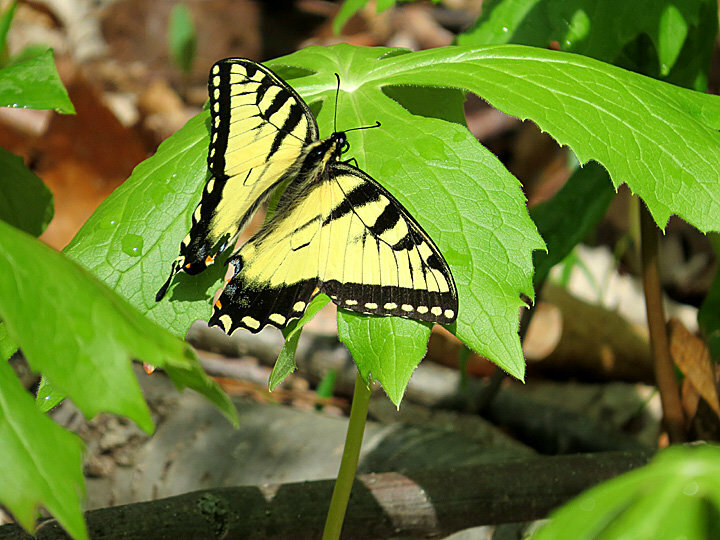 My first Eastern Tiger Swallowtail & my first Elfins of 2013. Eastern Tailed-Blue included one mating pair. Sightings recorded over 2.75 hours. Habitat: Paths and roads through hilly mature woods. 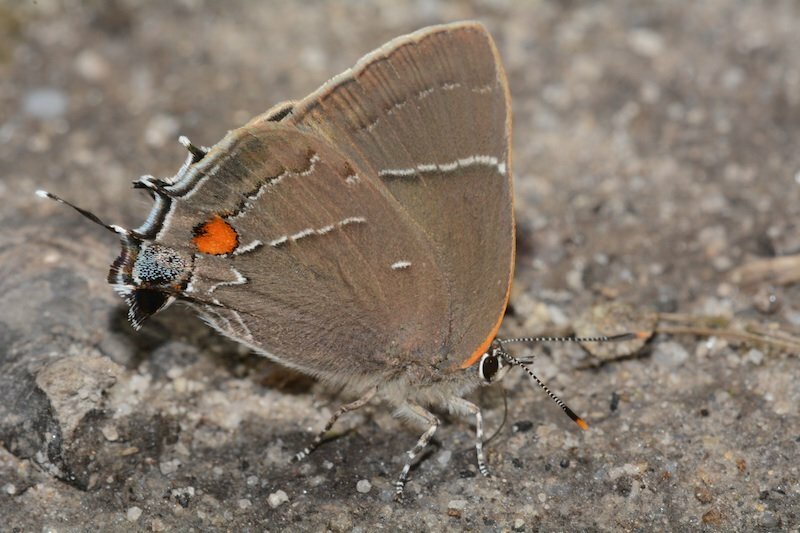 Dennis and I went to the known locale for Muir’s Hairstreak. This is the same spot Robert Pyle wrote about in his book “Mariposa Road”. 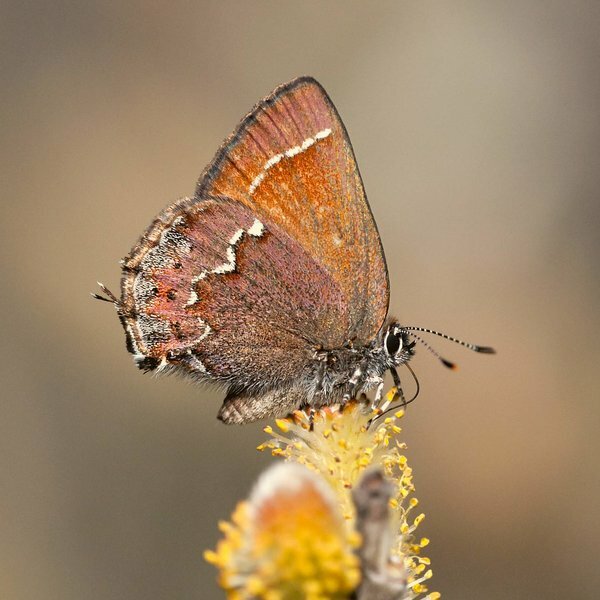 Our sightings of Muir’s Hairstreak are listed under the Juniper Hairstreak listing. A cool morning, 55F, with limited bright sun at about 10 am before a cloud bank rolled in at about 11 am bringing mist and rain. 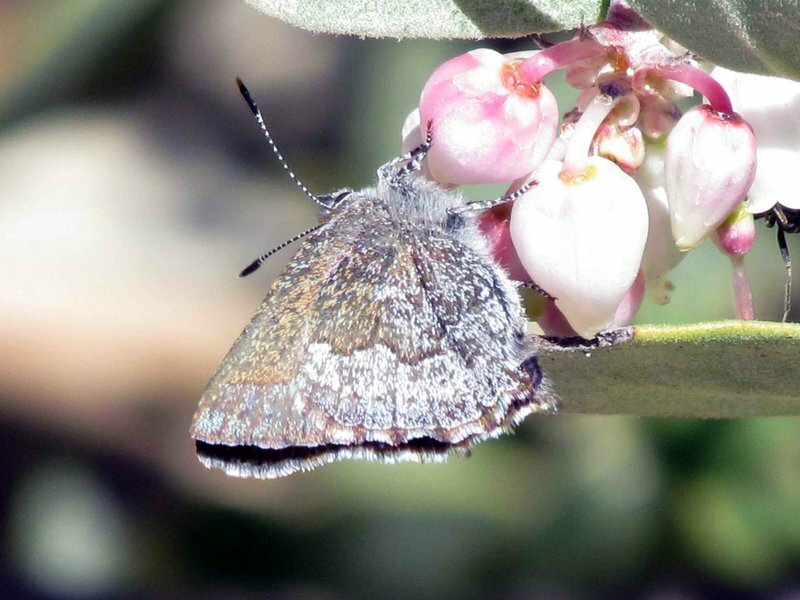 All sightings were on a ridgeline utility right-of-way through scrub oak and mountain laurel. Photo by Walter Gould. 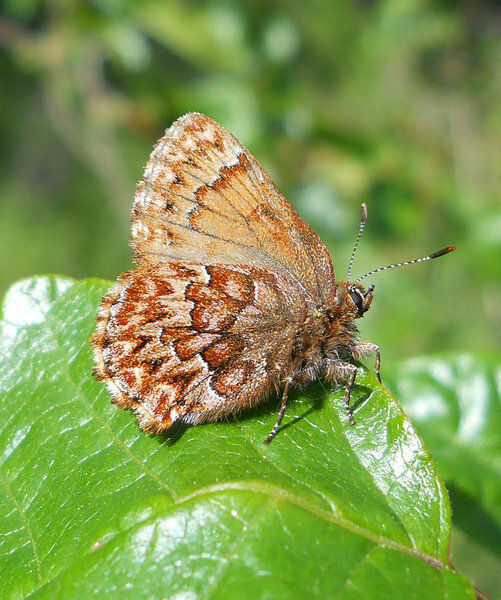 Brown Elfin was a first for me at this locality although it has been recorded her by others. The spot I saw it is not the spot where it has been seen by others in past. While birding this morning, we came upon an Eastern tiger swallowtail sunning itself on a May apple! We butterfliers in the group all went “Awww…”.